This holiday season, let Crayola bring the smiles to your children's faces! I know my Little's will light up with anything Crayola under the tree. Remember getting the super special box of 64 crayons with the pencil sharpener in the box? Or the special edition box with a "new" color? 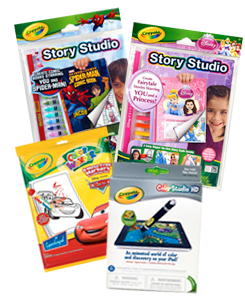 Now, let Crayola add a new layer of excitement this year, with their Crayola Story Studio AND exciting new iPad apps with an imarker! 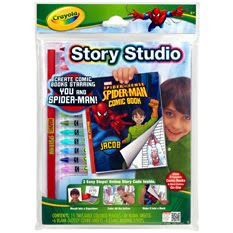 Crayola introduces the Story Studio this year, featuring Spider Man, Disney Princesses and Cars 2. 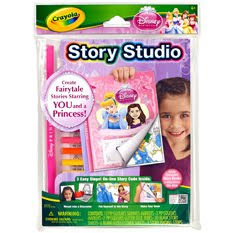 The perfect sets to allow your Littles to create an amazing story. Spider man was my favorite, using a comic book style to imagine yourself and Spiderman, working together for justice. :) The kit also contains binding strips to bind your creation into a book you can read over and over. Each Story Studio includes enough materials and supplies to make THREE story's. Special markers, pens or twist crayons are included as well. These sets retail for about $9.99 each. My favorite Crayola product this year has been the iMarker, which works in conjunction with the ColorStudio HD ipad App. My Little's love our (my! :) iPad and there are more games than adult apps on it. ColorStudio HD takes coloring to the next level though, and it's awesome! Not only is it a virtual coloring book, but it's convenient and there is NO MESS! No water, no magically appearing ink! The coloring pages come to life with animated scenes, sound effects and hidden surprises. It really is as cool as it sounds! 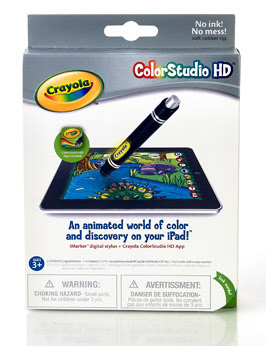 Kids can select from 64 colors in the digital Crayola 64 Box and then use the iMarker to create the look of Crayola crayons, markers, paints and colored pencils as the stylus interacts with an iPad. The digital coloring pages respond with movement and sound as the pages come alive as kids color. Animated images stop moving on the screen so kids can easily color them in without going outside of the lines, so objects look picture perfect when they start moving again. Tidy up your page with an eraser function or an "undo" arrow that removes larger areas of color. In addition, kids can save their work in a gallery to be emailed, printed or uploaded to Facebook (mom´s account, and with her permission and help of course! ), and also free draw, play interactive games and create their own customized coloring pages they can print and color off-line. These Crayola items are some of my favorite products that Crayola has created in the last year. The ease and fun of both the Studio Story's and the ColorStudio HD have brought lots of smiles and hours of fun to our kiddos. So, do you want to win some for your very own Little? Here's your chance! 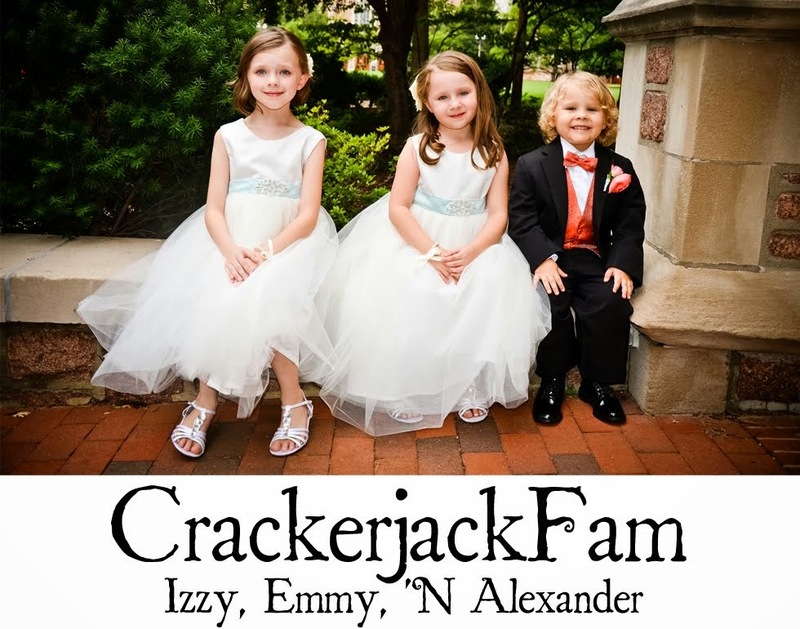 MyBlogSpark and Crayola gave me the opportunity to try out these amazing products AND they are offering one of my lovely readers the same package! JUST IN TIME FOR THE HOLIDAYS! This would make a fantastic gift under the tree! Happy Commenting! Giveaway begins tonight and will end THURSDAY, DECEMBER 15th at Midnight! One winner will be chosen using random dot org and announced Friday morning. Winner will have 12 hours to respond or another will be chosen. We love the Crayola Bathtub Crayons! As a kid I loved the circle tower with all the crayons, thought it was the greatest thing ever! 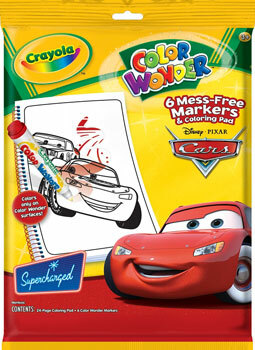 As an adult/zoo keeper of 3 children color wonder was the best thing next to the magic eraser ever!! We love the color wonders! No mess especially when we travel. my daughter loves their bathtime crayons but I really like the color wonder markers! Awesome!!! I love Crayola and all their products. My kids would love the Glow Station!